When I was a kid of around 10 years old, I used to collect small motors and electrical components with my school friends in Nairobi. We’d find some batteries and create small rotating and whirling contraptions, dreaming of how we’d one day make a walking robot that we could sit in and control – no doubt inspired by the Star Wars AT-STs. I’ve always enjoyed tinkering. It’s what drove my interest in telling the stories of Africa’s innovative hardware hackers in the jua kali sector, writing on AfriGadget. It’s why helping to organize and be a part of Maker Faire Africa has been so much fun for me (which I’m missing, as it’s taking place this weekend in Cairo, due to family reasons). It’s why I buy kids solar and hydraulic kits to build things with my daughters. I’ve been buried in the software (web) side of technology for the past few years. In this space it seems like we’ve been happy with de-linking software and hardware, after all, pure internet software is easier to spread, export and get access to. I can’t shake the tinkering side though, knowing that the two sides are interlinked and that more of the bridging of the two is needed. We’re just waiting for the Moore’s Law treadmill to slow down enough for the two to sync up again. 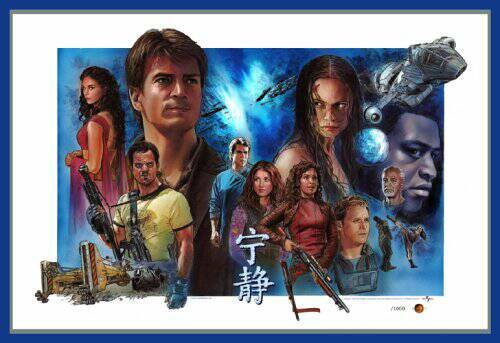 Laura Walker Hudson shares a fascination with the Firefly TV series, which suffered a short-lived life spanning only half a season in 2002. It’s a space western, reminiscent of Star Wars, gritty with witty realistic characters. That’s not why I’m bringing this up though. Laura reminded me of what something that made the show more compelling, the fact that it was a merging of Western and Chinese cultures. This reminded me of an article I read about the Shanzhai hacking, copying and innovating culture in China. The contemporary shanzhai are rebellious, individualistic, underground, and self-empowered innovators. They are rebellious in the sense that the shanzhai are celebrated for their copycat products; they are the producers of the notorious knock-offs of the iPhone and so forth. They individualistic in the sense that they have a visceral dislike for the large companies; many of the shanzhai themselves used to be employees of large companies (both US and Asian) who departed because they were frustrated at the inefficiency of their former employers. They are underground in the sense that once a shanzhai â€œgoes legitâ€ and starts doing business through traditional retail channels, they are no longer considered to be in the fraternity of the shanzai. They are self-empowered in the sense that they are universally tiny operations, bootstrapped on minimal capital, and they run with the attitude of â€œif you can do it, then I can as wellâ€. This sounds like we’re seeing the beginnings of our sci-fi worlds becoming real. Mix this with what you see in other parts of the world with open hacking garages, like what my friend Dominic Muren (TED and PopTech Fellow) is doing with Humblefactory. We’re seeing hardware hacking spaces being set up, allowing small-time inventors to cook up new ideas on machines that they couldn’t afford by themselves. This is a trend that is growing. Large technology companies drive both the diffusion of technology globally, and the costs of components. As the parts needed to make new tech “things” become commoditized, smaller manufacturers can get them at a low enough price point that they can also create their own inventions and sell them profitably. This is where the Shanzhai story becomes so compelling. We’re able to create more customized, and more innovative products, because they’re not created for a generalized mass market. There was an article in the Wall Street Journal recently about small factories taking root in Africa. Most of them don’t have much, or anything, to do with technology creation. However, the story does point out the emergence of more manufacturing happening on the continent. It makes me wonder what would happen if we had our own jua kali industry working on higher tech products, like their Shanzhai counterparts in China. What types of innovative technology (hardware and software) would come from Africa that differs for the local context? I won’t go into a great amount of detail, on what I’ve written before around the idea of “Hardware Hacking Garages: hardware and accessories innovation” in Africa. I think we need it, as it could help kickstart this next phase of localized R&D, prototyping and ultimately small-scale manufacturing that we need on the continent. If we can’t provide a technology manufacturing base of our own in Africa, I’m worried that we’ll forfeit our future in the space. We might not reach the scale of Asia, but we need to have the competency and the capacity to do some of it locally. Another way of thinking about this is that the non-traditional businesses in Africa are well positioned to provide a distributed manufacturing base already. Think of it as horizontal scale instead of the vertical scaling you see in massive Asian factories. If there were a way to provide logistical, communications and market efficiencies to that loose and distributed network, then we might find that the foundation is already set. Paul Currion recently compared Abraham Moslow’s quote, “When the only tool you own is a hammer, every problem begins to resemble a nail.” to an article by Cory Doctorow in the Guardian titled, “Laptops, not mobile phones, are the means to liberate the developing world“. The basic premise is that we cannot expect great innovation and technological breakthroughs from Africans until computers are ubiquitous in Africa. He states that the mobile phone just doesn’t provide the platform necessary for real programming and hacking to happen. That mobile phones are an interim step, not the final answer. And finally, that IT infiltrates social groups when, and as, they find a personal need for it. Cory’s points are valid. All things being equal the best device to get into the hands of kids is a personal computer. Having a full-sized keyboard and monitor are better than trying to program on a mobile phone. There’s nothing to disagree with there. 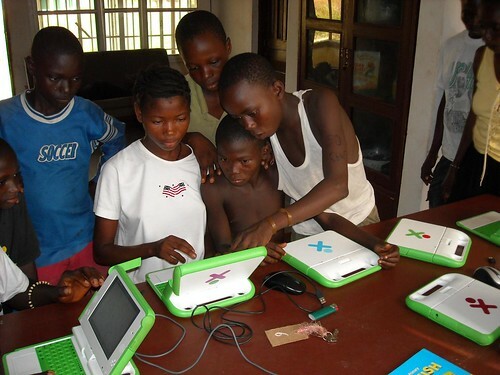 One of the reasons I have liked the OLPC initiative is because they have forced the door open to low-cost laptops in the developing world. The more computers we get into the hands of kids, the better Africa’s future will be. However, there’s the reality that I see on the ground as I travel. Sure, there are a few people with access to computers and who are creating applications and services through it for the web, PCs and mobile phones. They generally have a college-level education and are entrepreneurial in nature. A lot of the innovative work being done on the PC is applications for the mobile phone. So, PC access plus education tend to equal more mobile applications. The other item that I’m finding more and more of a problem for mobile developers is getting the license to actually get their product to market, much less sell it. If they do, it’s at outrageous rates that the carriers should be ashamed of. Here’s an interesting question. What happens as we see the merging of mobile phones, PCs and the web? We’re talking about the “mobile web” more and more, and how smarter devices like the iPhone, Android and Symbian devices let us do almost as much as we can on a PC. Will full-sized PC computers become less relevant as we simply attach keyboards and/or monitors to the device in our pocket? That’s a question I’d like to explore more. Are there examples of this type of work happening already in any organized fashion? 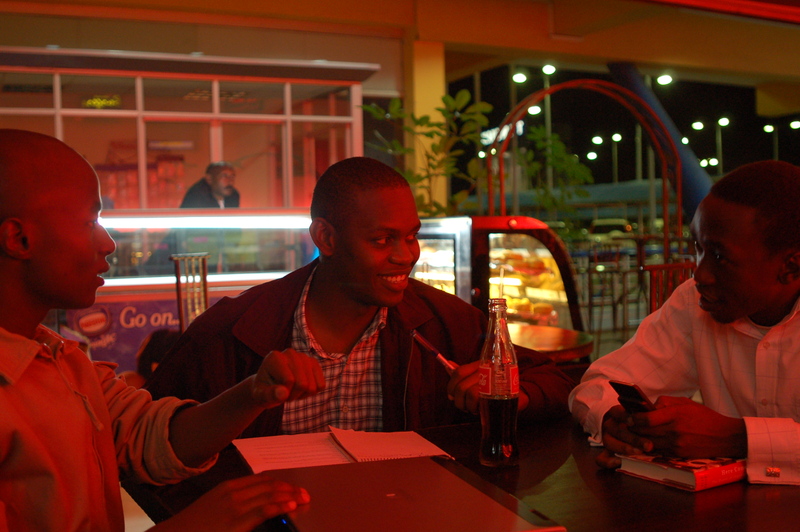 One of the thing I love about coming to Kenya is the passionate developers that are scattered around Nairobi. Tonight 6 of us got together to hack on the borrowed BugLabs device, and to brainstorm a Sony Ericsson SDK mobile phone application. 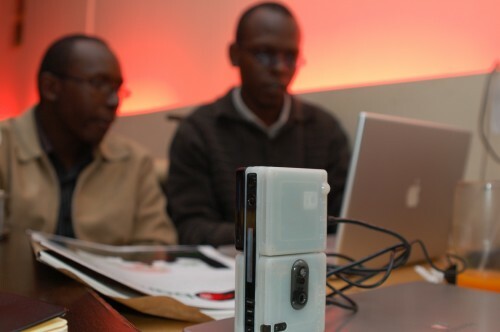 Eric Magutu, Laban Mwangi and Steve Mutinda were all there to brainstorm a cool application that would allow them to utilize some of the neat features available in the Sony Ericsson SDK that had been showcased at Skunkworks last week.